SNIP: [A]s sea ice melts, ice-avoiding killer whales have been moving deeper into the Arctic Ocean, hunting and killing both narwhal and beluga whales. Other whale species — including minke, bottlenose, fin, and sperm whales — are also making their way north as the Arctic heats up. At the same time, on land, grizzly bears, white-tailed deer, coyotes, and other animals and birds have been expanding their range into the warming boreal forest and Arctic tundra. For the indigenous people who subsist on Arctic animals such as muskoxen, caribou, seals, polar bears, and eider ducks — species that are in decline in some places — the newcomers are potentially a welcome addition to their diet. But emerging evidence suggests that some of these newly arriving species may be bringing rare or novel pathogens to the Arctic. In recent years, a plethora of deadly and debilitating diseases have struck reindeer in Scandinavia and Russia, muskoxen on Banks and Victoria islands in Arctic Canada, polar bears and seals off the coast of Alaska, and eider ducks in northern Hudson Bay and the Bering Sea. One possibility…is that climate warming and ecosystem changes are causing some bacteria, such as those that cause avian cholera, to mutate, or may be making Arctic animals more susceptible to pathogens that previously did them no serious harm. Another possibility being investigated by scientists is that bacteria such as anthrax — an outbreak of which resulted in the culling of 250,000 reindeer in western Siberia in 2016 and 2017 — are being liberated by rapidly thawing permafrost. Because most Arctic animals have been isolated for so long, scientists say, many of them have no immunity to diseases such as phocine distemper, which was first identified in the Arctic in 1988 and resulted in a massive die-off of harbor and gray seals in northwestern Europe. There is now mounting evidence of phocine distemper-like viruses in the North Pacific and Western Arctic, where beluga whales have no immunity to the disease. Many pathways exist for disease and pathogens to enter the Arctic. Toxoplasma gondii, a parasitic pathogen normally associated with house cats, has been found in polar bears and Arctic fox in the Norwegian Arctic archipelago of Svalbard, even though cats are banned there. 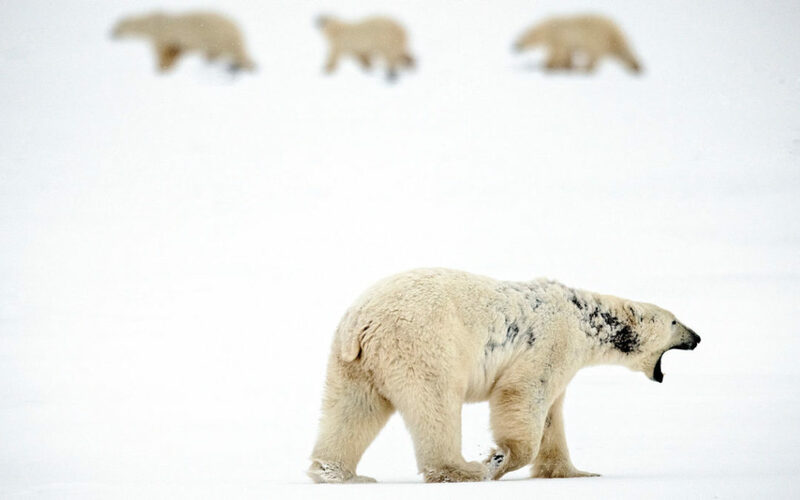 Veterinarians and biologists are also increasingly concerned about the spread of parasites and diseases into the Arctic on land. A major concern is white-tailed deer, which are carriers of the meningeal brain worm. While deer are unaffected by this pathogen, moose and caribou often die once infected. White-tailed deer have moved north and are now well established in the Yukon and southern parts of the Northwest Territories, and biologists say it is only a matter of time before they migrate into Alaska.